Glen James found a backpack containing more than $40,000 and turned it into police. BOSTON — A fund for a homeless man who turned in a backpack with more than $40,000 inside has collected more than $100,000, an overwhelming response that’s a “statement to everyone in America,” said the man who started the donation drive. Glen James flagged down a police officer on Saturday after he found the backpack containing $2,400 in cash and almost $40,000 in traveler’s checks at the South Bay Mall. The man who lost it told workers at a nearby store, and they called police, who later returned it to him. 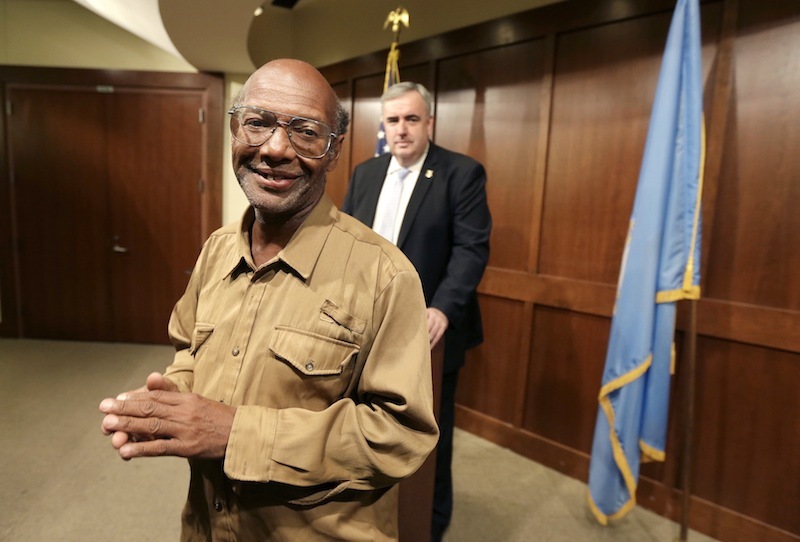 James, who once worked at a Boston courthouse, said even if he were desperate he wouldn’t have kept “even a penny” of the money he found. 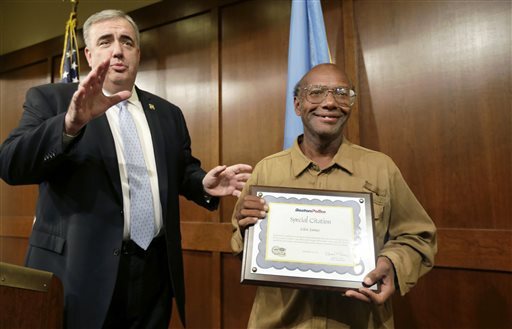 Boston police honored James with a special citation on Monday. A stranger from Midlothian, Va., Ethan Whittington, after reading media accounts of James’ honesty, started a fund for him on the crowd-funding website gofundme.com. By late Thursday afternoon, almost $111,000 in donations had been made. Whittington, an accounts manager for a marketing firm, said he’s overwhelmed by the generosity of strangers. “The fact that he’s in the situation he is, being homeless, it blew my mind that he would do this (turn in the backpack),” Whittington said Wednesday. Whittington said he’s also encountered some skeptics who question whether his efforts to raise money for James could be a scam. Whittington said he has spoken with James on the phone and hopes to travel to Boston soon to work out how the money will be distributed to him. He said his new fundraising goal for James is $250,000, up from the $50,000 he originally hoped to raise.